Putting Rules govern your play around the Green and it is your responsibility to know and apply them correctly. Etiquette deals with the manner in which you play the game.. In every sport there are rules to govern play and golf is no exception. 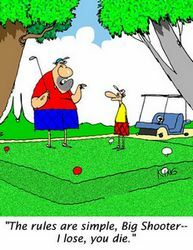 There are Rules that apply around the Green and you should be aware of how they will affect you. Part of improving your putting is in knowing the Rules around the Green. From time to time we all need to update ourselves on our understanding of our rights and responsibilities to play the game as it is intended to be played. Many golfers cost themselves unnecessary penalties because they unknowingly infringe a Rule. On other occasions they fail to take advantage of a Rule that gives them relief without penalty. I can personally recommend the excellent book 999 Questions on the Rules of Golf, written by Barry Rhodes. It takes the hard work out of understanding the Rules and is fun to read. His web site is at this address. Barry also compiles Rules School. In brief, familiarity with the Rules will make you a better all round player, and putter.